Discussion in 'Interior Restoration' started by Chuck71RS, Apr 8, 2019. When was the first year 2nd gen Camaros door panels had a stereo speaker? How large? 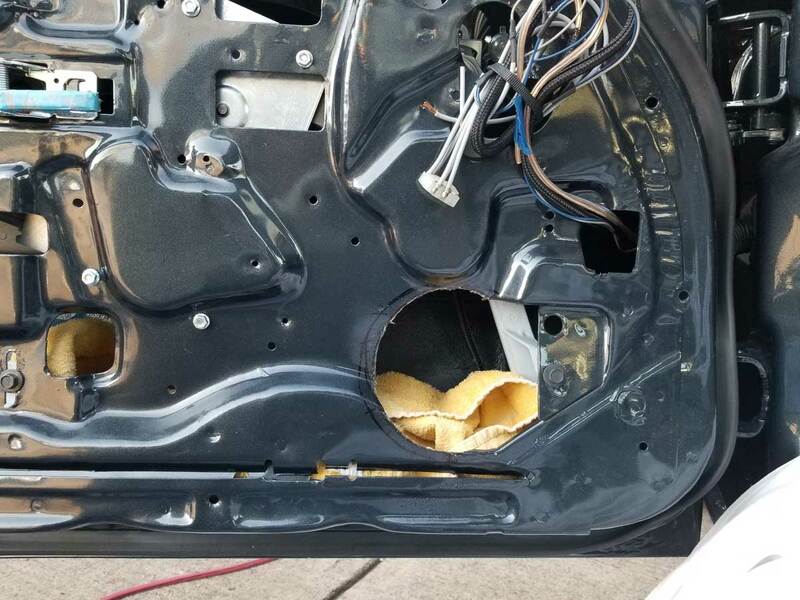 Door speakers in any second gen Camaro were not a factory option. Power windows and locks are the only wires originally run to the doors and no factory door panels were designed with speakers in mind. serpent710 and Chuck71RS like this. 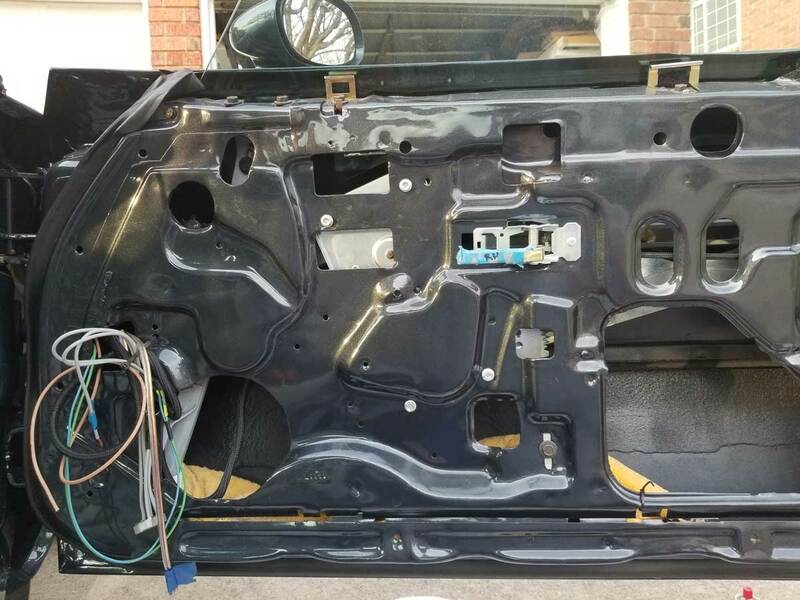 If you don't mind modifying the door, you could run the wires to the door and surface mount a speaker with the door weatherstrip cut open for some reflex room. I considered this but just didn't want to go to the trouble of opening the door wire holes. I had speakers in my doors at one time. 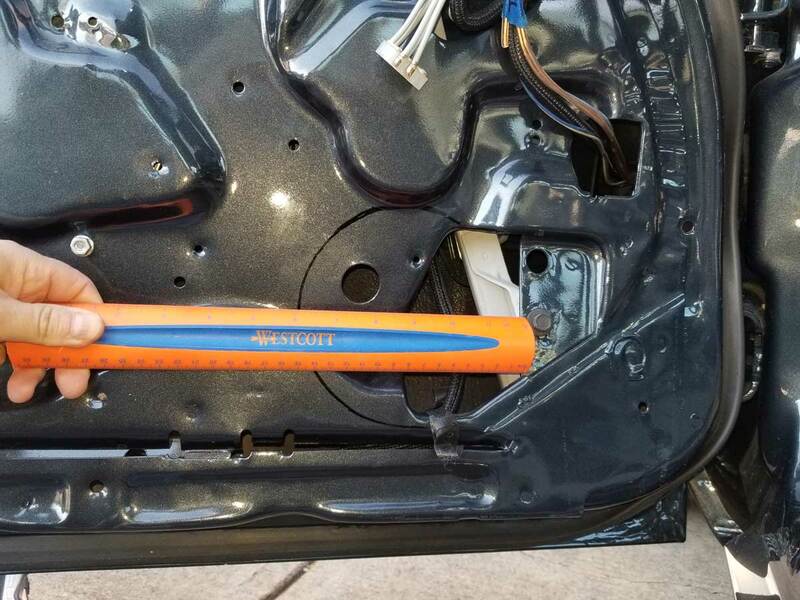 They didn't fit right and protruded out about an inch from the door panel. I decided to modify the factory center dash speaker holder (from info on this site) to accommodate (2) 4" speakers. In my opinion this is a much better solution. I bought a set of used door panels without non-factory speaker holes and never looked back. I've seen many people who butchered their doors by using a jigsaw to the cut the holes. I opted to do 6.5" speakers in my doors - I used a dremel with a bit intended for Marble and ceramics. (I had metal bits, but didn't use them because I was worried they wouldn't work well. Now that I have cut the panels, I guess I could try using one of those bits on the piece I removed.) I moved slow to cut a nice rounded portion into the door. It took me about 10-15 mins to determine where to cut the hole and about 30-45 mins per door. When I was done, I used a couple of files to knock down the burrs, then the raw metal edge with some paint to clean it up. I was very careful because even though no one would ever see this, I wanted them to look "original." Here are some reference pics, if anyone is interested. Finished with the cut... but havent removed the burrs. Same thing... but with the burrs removed on the Passenger door. Yeah... Ive seen some pretty mangled doors over the years. But I should probably have used a metal cutting wheel... and it likely would have taken a lot less time. I went really slow, and made small cuts to form the arch, then repeated the process until I penetrated through the thin metal layer. I can experiment tonight and let you know how it goes bc I still have the pieces I cut out. I may end up cutting them about 1/4" wider or so... to give myself a little wiggle room for the baffle/speaker combo. I may need the extra room to make it easier to mount the door panel. Excellent pictures and detail how you made those smooth round openings. I will do the same for I really want speakers in the doors. Even the 4" I had in the 71 lower door panel added to the stereo sound. The third pair of speakers under the dash will complete the surround sound. Will you mount the speakers behind the door panel? Any kind of enclosure around the speaker for protection? What is the baffle you are referring to? Did you consider any upward-backward tilt towards the driver? What about 5 1/4" instead of 6 1/2"? 1. Will you mount the speakers behind the door panel? That was the original plan - Now I may just mount them to the door panel. Im planning to do some test fits this week, then I will know for sure. 2. Any kind of enclosure around the speaker for protection? 3. What is the baffle you are referring to? I purchased these... and from the audio installers I talked with, they are definitely necessary. Also, my speaker instructions specifically state that you need to use something like this, or there will be "severe degradation" in sound quality. 4. Did you consider any upward-backward tilt towards the driver? The tweeters have tilt, but beyond that, I think the cabin is too small to really worry about it. If it is a problem, I can make something out of MDF to get me an upwards angle, but I think it's overkill and more work than needed. 5. Those would work too. I just happened to catch the exact speakers I wanted on sale and snatched them up.